5 Reasons Why You Should Keep Smiling! Smiling is not always an easy thing to do. We’ve all said “I am having one of those days” at some point and I think it is alright. Still, I think that we should keep smiling despite in all (no wait,…unless someone insulted you, or you failed a class,or…you woke up on a bad news,or…) NAH! None of this should be a reason not to smile really and here is…5 Reasons why we should always keep smiling. Your smile is your best makeup. It doesn’t matter if you don’t have beautiful teeth, you don’t have to show them when smiling. A smile is natural, organic and so…inexpensive! How not to use it? Go ahead and smile! I mean…now! STOP READING THIS AND…SMILE! Your smile can affect someone else. This is by far, my favorite reason to smile. People will go and say that you are fake because you smile all the time but let me tell you this; if they realized it, it means that you’ve affected them in some ways so you win anyways. Your smile makes you attractive. If people see you smiling everyday, trust me, they will think of you as a person fun to be around, with positive vibes and with a peaceful mind. Come on, who doesn’t what to be thought that way? Your smile will change you state of mind. 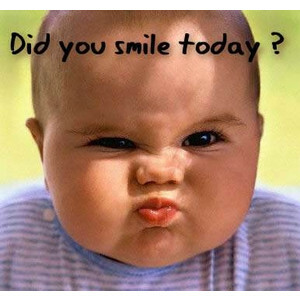 If you ever feel frustrated or angry, try smiling! It will change the way you look at the current situation and will change your way to interact with others during the day. So from now on, if you ever feel like life is not giving you any reason to smile, remember that you are the ruler of your life and not the other way around and think of these reasons above. I am sure you will end up showing your beautiful teeth. Reblogged this on brittmorgan13's Blog.